Consiga um excelente preço em The Serendipity Hostel - pontuação de 8,4 dada por hóspedes recentes. Lovely atmosphere and welcomin. The bar staff were great. The hostel is in great location. Close to all the main streets. The surroundings are green, and there are cute puppies and a kitten living there. Good location, very clean (they clean the bathroom constantly), comfortable room, good service, very tasty food (breakfast is not included) and very sociable place. Very nice atmosphere for backpackers. Nice garden, sweet puppy and kitty. Good location for the downtown just 10 minutes for a walk. And friend staff. The hostel was really nice and full of friendly other solo travellers. The people that worked there were many travellers Roland gave advice on where to go and stuff. The hostel was really good value for money. This hostel is very sociable. There is a very nice garden and common area where travellers were always socialising and hanging out together. There were puppies and a kitten there too, it was perfect, I even saw a frog! On sundays and wednesdays they have a kind of club night which can get pretty wild! Great atmosphere, awesome staff and Lana was an absolute babe. Best hostel I stayed in whilst in Vietnam. Great place to stay when in Hoi an, very central but still away from the crowds. A nice garden and a awesome lounge area. It is great to meet other travelers. Wednesday and Sunday, youll have party in the house, so not the best place for family/kids. I personally loved to stay there and the staff is awesome! thanks guys, you made me feel at home! "If you're a drinkpacker, you'll like enjoy the party"
"Lovely atmosphere and welcomin. The bar staff were great." "Location, people, staff and the common areas so comfy"
"The hostel is in great location. Close to all the main streets. The surroundings are green, and there are cute puppies and a kitten living there." "Good location, very clean (they clean the bathroom constantly), comfortable room, good service, very tasty food (breakfast is not included) and very sociable place." 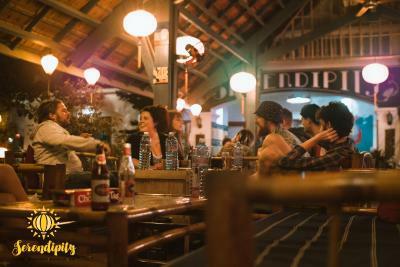 "Very nice atmosphere for backpackers. Nice garden, sweet puppy and kitty. Good location for the downtown just 10 minutes for a walk. And friend staff." "The hostel was really nice and full of friendly other solo travellers. The people that worked there were many travellers Roland gave advice on where to go and stuff. " "This hostel is very sociable. There is a very nice garden and common area where travellers were always socialising and hanging out together. " "Great atmosphere, awesome staff and Lana was an absolute babe. 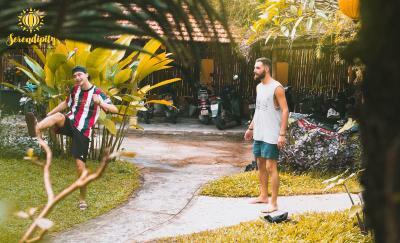 Best hostel I stayed in whilst in Vietnam." "Great place to stay when in Hoi an, very central but still away from the crowds. A nice garden and a awesome lounge area. It is great to meet other travelers. " Localizado a 1,2 km da Ponte Coberta Japonesa, o The Serendipity Hostel em Hoi An dispõe de um jardim e de um terraço. Os locais de interesse populares nas proximidades incluem o Assembly Hall of the Cantonese Chinese Congregation, o Museu Histórico de Hoi An e a Assembleia Municipal da Congregação Chinesa de Chaozhou. A aldeia de Thanh Ha fica a 2,5 km do hostel. O acesso Wi-Fi é gratuito para todos os hóspedes, enquanto alguns quartos estão equipados com uma varanda. A área é popular para ciclismo e o aluguer de bicicletas está disponível no hostel. A Aldeia de Cerâmica de Thanh Ha fica a 2,8 km do The Serendipity Hostel, enquanto a aldeia de Kim Bong Carpentry está a 22 km da propriedade. O aeroporto mais próximo é o Aeroporto Internacional de Da Nang, a 29 km da propriedade. Cam Pho é uma excelente escolha entre viajantes que estão interessados em cultura, bom ambiente e visitar centros históricos. Esta é a parte de Hoi An que os hóspedes preferem, de acordo com comentários independentes. The Serendipity Hostel dá as boas-vindas a hóspedes de Booking.com desde 15 de Out de 2016. 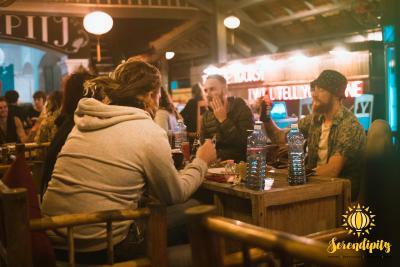 Em que período gostaria de hospedar-se em The Serendipity Hostel? Cama em dormitório com uma varanda, comodidades para churrascos e ar condicionado. Proximidades da propriedade – Esta área é uma excelente escolha para quem está interessado em cultura, bom ambiente e visitar centros históricos – Verifique a localização Excelente localização - mostrar mapa Os hóspedes adoraram passear pela área circundante! 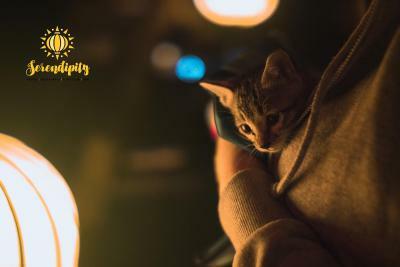 Informação essencial The Serendipity Hostel aceita pedidos especiais -adicione-o(s) no próximo passo! O check-in apenas é possível para hóspedes entre os 18 e os 40 anos. The Serendipity Hostel aceita estes cartões e reserva-se o direito de reter um valor temporariamente no seu cartão antes da chegada. Por favor, informe The Serendipity Hostel antecipadamente sobre o seu horário de chegada. Para isso poderá utilizar a caixa de Pedidos Especiais durante o processo da reserva ou contactar a propriedade diretamente através dos dados para contacto providenciados na sua confirmação. Um dos bairros mais pitorescos em Hoi An! "Location, people, staff and the common areas so comfy "
"The hostel is in great location. Close to all the main streets. The surroundings are green, and there are cute puppies and a kitten living there. " "Good location, very clean (they clean the bathroom constantly), comfortable room, good service, very tasty food (breakfast is not included) and very sociable place. " "The hostel was really nice and full of friendly other solo travellers. The people that worked there were many travellers Roland gave advice on where to go and stuff. The hostel was really good value for money." "This hostel is very sociable. There is a very nice garden and common area where travellers were always socialising and hanging out together. There were puppies and a kitten there too, it was perfect, I even saw a frog! On sundays and wednesdays they have a kind of club night which can get pretty wild!" "Great place to stay when in Hoi an, very central but still away from the crowds. A nice garden and a awesome lounge area. It is great to meet other travelers. Wednesday and Sunday, youll have party in the house, so not the best place for family/kids. I personally loved to stay there and the staff is awesome! thanks guys, you made me feel at home!"